Glenlo Abbey Hotel & Golf Course has gained a stellar reputation for delicious food and five-star service. Throughout October 2018, they’re offering an inspired special afternoon tea, and you and three friends could win the chance to enjoy it! As the days grow shorter and colder, we’re offering you the chance to make yourself comfortable in the beautiful surroundings of Glenlo Abbey with a decadent afternoon tea, where you’ll enjoy an opulent setting with elegant, welcoming service, transforming tea into an indulgent treat. Afternoon tea is served Monday to Friday in the intimate and elegant Kentfield Suite, and in the timeless elegance of the River Room Restaurant at weekends, from 1.30-4.30pm. 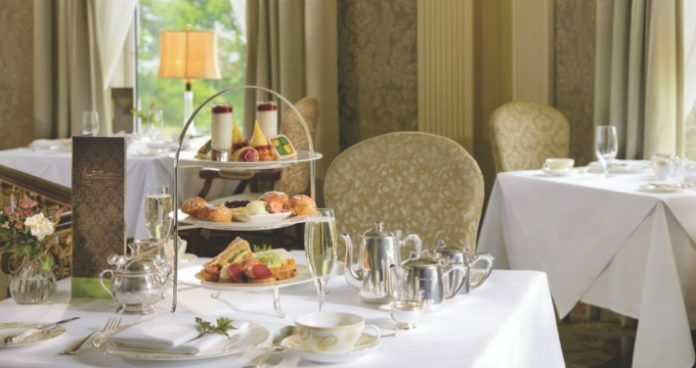 Set on a 138-acre estate overlooking the manicured nine-hole golf course stretching down to the banks of Lough Corrib, afternoon tea at Glenlo Abbey Hotel is an experience you won’t forget. The fires are lit and ready to welcome you. We are giving one lucky reader the chance to win a luxury afternoon tea for four at Glenlo Abbey Hotel. Full details are available on the Glenlo Abbey Hotel website, where vouchers are also available to purchase. Previous articleWin a sumptuous afternoon tea at Lough Erne resort!